Gajar Halwa is a popular Winter-Spring dessert in Northern India. My Dad’s fave version has grated carrots that get slow roasted in a skillet over hours to become almost candied and the mix is more like a soft crumble. 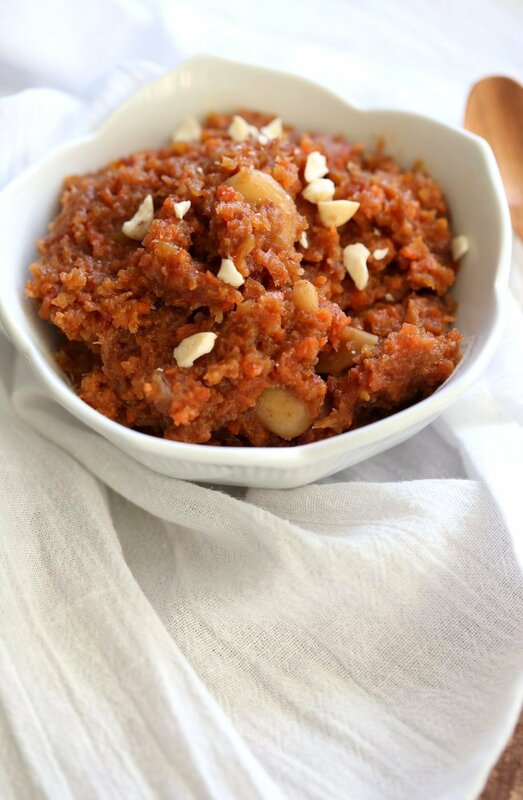 See my Stove top carrot halwa version here. This Instant pot version cooks within minutes and works amazingly. The Carrots get roasted with sugar for a bit then pressure cooked, then roasted again to dry them up. This Instant Pot Halwa will cook to a softer more pudding like state, and gets close to the stove roasted one after sitting for a bit to cool. I use purple and red carrots for the gorgeous color that would normally show up only on long roasting. To make this nut-free, use sunflower seed meal and omit the cashews. Make this delicious dessert for Holi (the festival of colors coming in March) or valentines day (use more purple carrots!) 🥕🥕. See video above the Recipe. I know what you are thinking, that the Serving size should be 1 ;). Well, the 4 serves are dessert portions. Serve after a good meal! If you make this, do let me know how it turned out! Subscribe to My Youtube Channel for more videos. 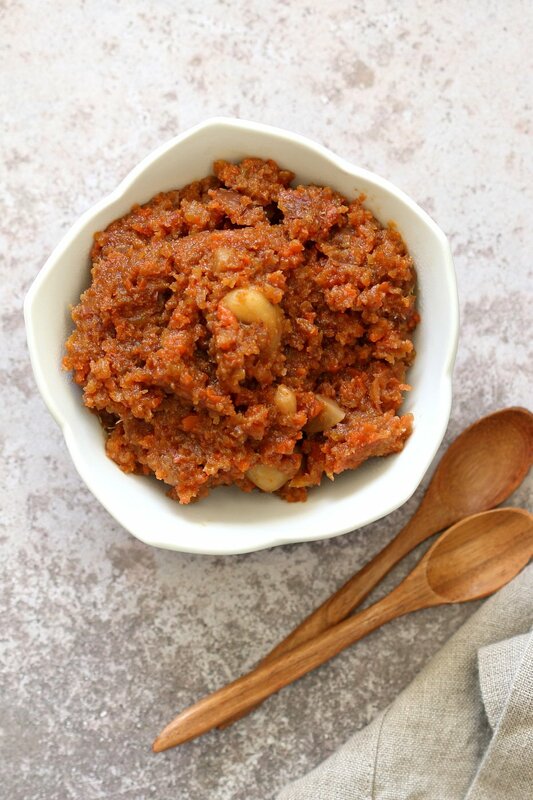 Instant Pot Gajar Halwa / Gajrela - Vegan Carrot Halwa Recipe. 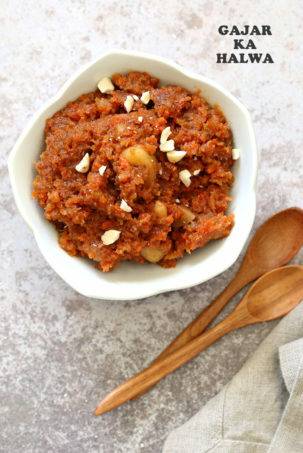 Carrot Halwa is an Indian dessert, a flourless Carrot Cake Crumble/pudding that is spiced with cardamom and served during festivals. Vegan Gluten-free Soy-free Dairyfree Recipe. Put the Instant pot on Saute (Stove top pressure cooker over medium heat). Add vegan butter or oil. Add cashews and cook until golden. Stir occasionally. About 2-3 minutes. Add dates/raisins and cook for a few seconds. Add carrots, sugar, salt and almond meal and mix well. Cook for a minute. Add non dairy milk and mix in. Close the lid. Pressure cook for 6 to 7 minutes manual, hi in Instant pot. (3 mins over medium heat in stove top pressure cooker). Let the pressure release naturally. Open the lid, Mix in the cardamom. Taste and adjust sweet if needed. Put the pot on Saute and cook the mixture for 3 to 4 mins to roast it well and to dry out the liquid. Stir well in between to avoid sticking. At this point you can add another 2 tsp vegan butter and mix in. Once the mixture starts to stick and is dry-ish. Switch off and let it sit. The pot will be hot for a while, let the carrot mixture slow cook in the heat for 15 mins or so. Stir once in between. When the mixture is warm-cool, serve, or store refrigerated. Garnish with chopped cashews or pistachios to serve. Stove top version here. For additional mava flavor, add a 1/4 tsp nutritional yeast with the salt. To make this nut-free, use sunflower seed meal instead of almond meal, and omit the cashews. 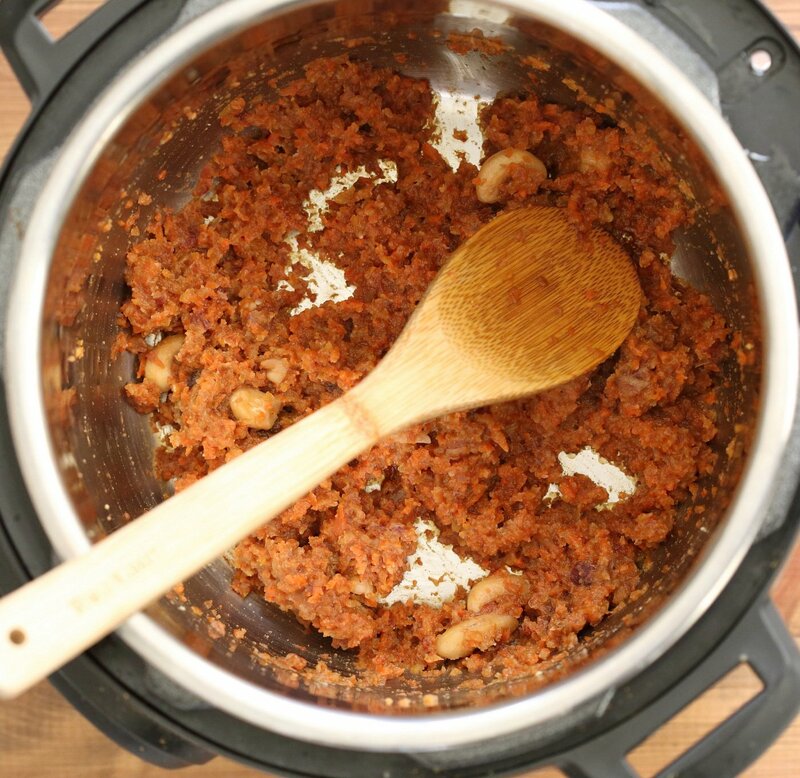 This recipe is adapted from my Stove top Vegan Gajar Halwa. This looks delicious and I would like to try it but I find the amount of liquid is very low for an IP. Is 1/4 almond milk cup correct? Or do the carrots provide enough liquid to bring the pot to full pressure? The carrots release moisture during cooking so it works out fine. If you see the video, right after opening , there is some moisture with the carrots about 2 tbsp or so. Thats why it gets sauteed for a few minutes to cook that out. If you feel like your carrots arent juicy enough, try with a 1/3 or 1/2 cup liquid. I finally got around to making this yesterday and it is delicious! I did add a little extra milk because the carrots I had seemed dry. It turned out perfectly. Thank you for another great tasting and easy to make recipe. Can you provide a method for cooking that’s not in the Instant Pot, and perhaps just stovetop? Love this video and recipe. Sharing to my page and group on fb. I tried this and it was too dry–burned to the bottom of the Instant Pot and wouldn’t seal. I would definitely recommend adding liquid. it depends on the carrots i guess. Mine doesnt dry out. you can use a 1/2 cup milk. When i made the video, I reshot the almond meal part as i had forgotten to add that, so the mixture dried out for another 2-3 mins and then i closed the lid and it still worked. I have noticed that sometimes the IP takes longer to come to pressure for various reasons. So if your unit by your experience takes longer or generally needs some extra liquid, then add some more. the extra liquid can be cooked out later on saute. Maybe try doing the pot in pot method. You could put a couple of cups of water in the bottom of your IP and put a stainless steel ring or trivel and then put a small stainless steel mixing bowl on top of that. Would it work in a regular pot onstead of a pressure cooker? If yes how would it work and how long would it take? Do you think it would work with zucchini instead of carrot? I have a bunch of zucchini I need to use up. yes. There is a squash halwa that uses opo squash which is similar to zucchini and its a similar process so it should work. Add some thick cashew cream when you saute mixture after opening the lid for a creamy halwa. Awesome! Thanks. I will try it tonight. It turned out so good with the zucchini! They are very wet so there was plenty of liquid. I used coconut sugar instead of cane and I did add some cashew cream as you suggested. My husband and son loved it as well. We will definitely be adding this super easy vegetable dessert to our rotation. Thanks so much! I really am so grateful that you do what you do. It makes it easy to cook healthy vegan food for my family without having to rely on packaged foods. So many of your recipes are just part of our days now. Awesome! i think with zucchini, no milk during pressure cooking will work too. So glad everyone loved it! And thank you for the wonderful note. I am happy that you try out the recipes and they turn out well! Made this for a Vegan Dinner group and it everyone loved it, so I got a chance to pass on both the recipe and of course your site! I didn’t use any sugar but added a couple more dates. Used a tablespoon of coconut oil at the beginning and 1/2c TJ’s reduced fat coconut milk. It was moist but not wet after pressure cooking so didn’t do anything more except add the spice. It firmed up a little further since it was a few hours before it was served. Another excellent recipe, thank you. Awesome!! Yes adjust away to preference. The traditional indian version is much sweeter and much more roasted and more dry somewhat like candied carrots. Either which way in texture works out very pleasing. Yes chopped cardamom is definitely fresher and better than powder. I would say use a combination of both so the cardamom flavor mixes in quickly with the powder and does its slow refreshing release with the whole seeds crushed. I generally make it with almond milk. Somme soy milk brands dont behave as well. coarsely ground cashews will work. I havent used dairy in years so i wouldnt know. I cannot recommend using dairy in any of my recipes as his blog and I are vegan for ethical reasons and he point of the blog is to show that dairy isnt needed in making great food. Many cows and baby calfs are killed worldwide for dairy. India is the largest exporter or beef and veal(baby cow meat) in all of the World, Because of the Dairy industry. 2.4 Million Tonnes of beef and veal are exported each year, almost all of which comes from spent Dairy female cows and Baby male calfs who are useless for the dairy industry. 38500000 cows are slaughtered every year in India, that is 105900 per day, 4390 per hour. Animal agriculture is also the largest producer of green house gasses, more than fossil fuels, and uses many times more Resources(water, land) of the planet. The alternate non dairy milks and yogurts, creams, butter taste equally good and are beneficial for people, health, environment, as well as the planet. I am going to try this recipe! I am also vegan for ethical reasons. Have been trying your other IP recipes and loving it. Thank you! This has become a special occasion dessert for my significant other and myself. This evening we celebrated our four year anniversary with your japanese curry and this as a dessert. Thank you for being you, and continuing to be in our home. With love, our family. This was heavenly, as good as the gajar halwa I used to make before with milk. I have been gradually cutting out animal products from my diet and recipes like the ones you share (I have also tried the vegan “butter chicken”- and loved it!) make the transition much less daunting. I can’t thank you enough for perfecting these recipes for us- I have been having a lot of fun in the kitchen with delicious results to boot! Thats awesome!! So glad you loved it! I am def making this. I am hosting an Indian vegan brunch on coming Sunday. This will be a fitting dessert as I have several pounds of carrots in the fridge.